Whatever your commercial landscaping or garden maintenance needs - and whether you run a business in or around Luton, Bedfordshire or have a home in the area - Ricky Tyler Landscapes can provide a specialist service for you. We can carry out any task, from one-off tree surgery jobs to grounds maintenance on a regular basis, with a full garden support team to perform it. Whether it's leaf clearance in Kensworth or lawn care and turfing in Wigmore, we can work to schedules that include weekly, fortnightly and monthly visits, organised around a time that suits you wherever it is you live in Luton, Bedfordshire or nearby. Alongside this, we can also give you the assurance that our team is fully CRB-checked with all of the necessary health and safety policies and insurance behind them. When it comes to the specific services we provide, the same standard of quality is given wherever you are, from Dunstable to Whitwell and Streatley to Redbourn. For businesses and other commercial enterprises, our range includes hedge trimming, grass strimming, line marking for sports pitches, flower bed care and moss control, among many others. As for residential homes, we can provide many of the same services for garden maintenance as well as driveway and patio refurbishments, specialist spraying services and lawn care and turfing. For both sectors, we will offer to discuss your grounds first with no charge for our advice or any obligation to follow through with it. We have also got in place our own strict customer service procedures which ensure all our staff maintain high standards at all points in the service, whereas we carry out spot-checks on them while they work to ensure these are being upheld. 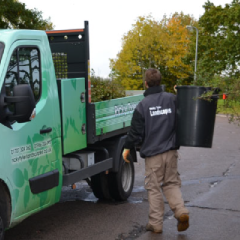 It is also part of our eco-friendly approach that we remove all garden waste once the job has been completed, and have it composted or recycled whenever either is possible. 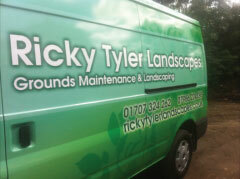 Ricky Tyler Landscapes can provide gardening and grounds maintenance services including Luton Grounds Maintenance covering Luton, Bedfordshire .